The PeeWee Pivot 2.0 is a convertible notebook come tablet who’s screen rotates to create your desired device. Its equipped with a 10.1 inch screen and is available in two resolution options either: 1024 x 600 or a slightly higher 1366 x 768 resolution screen. Powered by an Intel Atom processor and has 160GB HDD together wit 2-in-1 SD/MMC memory card reader it has been designed to with stand extra tough love from class mates, with a durable, drop and spill resistant construction. It also fitted with a web camera and has integrated UMS Intel graphics and comes with a sturdy plastic case and removable carrying handle. 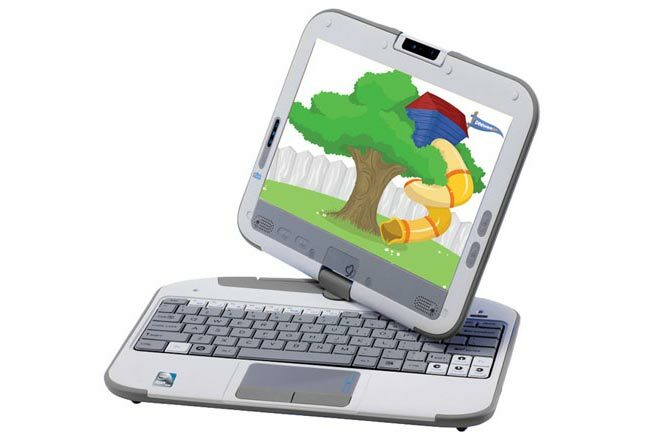 Preinstalled software on the device includes: 15 Educational Games and 2 Security Suites together with Microsoft Windows 7 Starter, Microsoft Works 9.0.